Will Garfit presents a selection of the diversity of his artistic life depicting the landscape and countryside with brush and pen, for which he is so well known. In his oil paintings, Will specialises in paintings of rivers, lakes, lochs and sea. He always paints on the location of his subjects whether the chalk streams of the south or salmon rivers of the north. His oils are vibrant and fresh and full of his presence of being in the landscape and the subtleties of its mood and light. He also loves the north Norfolk coastal landscape which he paints for joy from the family cottage in Cley. He captures the moods of the marsh with the background of wide horizons of the sea and sky. Well known sepias from over thirty country sporting books which Will has illustrated. With great skill as a draughtsman combined with his delicate and spontaneous watercolour technique he creates charming vignettes of birds and animals of the countryside and its sports of shooting, fishing and hunting. Also a selection of full colour prints from his oils of rivers, from wild water of Scottish spate rivers to the calm of lakes and southern chalk stream meadows. 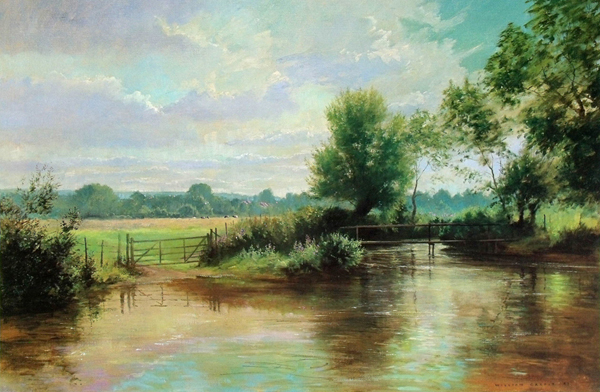 Much of Will Garfit's work is by commission, on rivers of special personal interest to the owners or those who fish them, whether for trout or salmon. His paintings capture the solitude of such beautiful landscape and the excitement of fishing there. Also shown are examples of some of his detailed paintings of houses ranging from cottages to castles. In "Will's Shoot", 1993, followed by "Will's Shoot Revisited", 2005, he tells the extraordinary story of developing his award winning area of disused gravel pits to become an idyllic shoot, fisheries and wildlife reserve, "Will's Shooting Ways", 2009, is an anthology from articles he has written for the Shooting Gazette magazine over the past seventeen years. Recently published is "Will's Pigeon Shooting", 2012, an authoritative book full of Will's enthusiasm and passion for the sport. New, Will's Pigeon Shooting, an authoritative book expressing Will's enthusiasm for the sport in his writing and watercolour illustrations. A must for the novice or expert a like.. Copyright © 2019 William Garfit. All rights reserved. Website by Slawko.